Pete Bronski, founder with wife Kelli of the blog No Gluten No Problem, is an endurance athlete, friend, colleague, and co-author of our new book (May release date), The Gluten-Free Edge: A Nutrition and Training Guide for Peak Athletic Performance and an Active Gluten-Free Life. Check here for pre-order details. And when we say, an Active Gluten-Free Life, we mean everyone on the planet, not just super-heros. After long hours (days, weeks, months) of researching, writing, rewriting, and interviewing gluten-free athletes and athletes who choose to be gluten-free, Pete is back logging long hours trail running and I’m back at Mary Jane telemark skiing. I’m also in the process of losing the 5 pounds I gained while writing and creating high-octane recipes for the book. Aahh, the irony of writing a book on sports nutrition (weight gain and a slide in fitness). It was worth it and I’m incredibly grateful for the experience, but now I’m on a mission to revive myself. My eating habits weren’t bad while writing the book, but I sat on my bum for way too many hours and my exercise routine, active lifestyle, and yoga practice suffered. That’s not something I want to make a habit of. I’ve found that the best way to kick-start my day and boost my energy levels is to eat a power-packed breakfast. That means a combination of high-quality carbohydrates, protein, and fat. Over the next couple of weeks I’ll be sharing healthy, gluten-free breakfast ideas for an active lifestyle. All will be vegetarian, nutrient-dense, and delicious. First up: gluten-free power porridge with whole-grain oats and teff—perfect before heading out for a day of skiing or hiking (or in Pete’s case, mega-distance trail running). McDonald’s Oatmeal Bowl contains the following ingredients: Oatmeal—whole grain rolled oats, brown sugar, modified food starch, salt, natural flavor (plant source), barley malt extract, caramel color; Diced Apples—apples, calcium ascorbate; Cranberry Raisin Blend—Sweetened dried cranberries (sugar, cranberries), California rasins, golden raisins, sunflower oil, sulfur dioxide as a preservative (contains sulfites); Light Cream—milk, cream, sodium phosphate, datem, sodium stearoyl lactylate, sodium citrate, carrageenan. What the heck is datem? DATEM (directly from Wikipedia): Diacetyl Tartaric Acid Ester of Mono- and Diglycerides is an emulsifier used to strengthen dough by building a strong gluten network. It is also known as E472e and is often derived from genetically modified soya bean oil. First off, if it’s called E472e, it’s not food (not to mention its other name). Really? We need a dough strengthener in our oatmeal? Aside from the fact that this oatmeal is contaminated with gluten, it’s filled with a boat-load of unhealthy ingredients. Leave it to McDonald’s to completely ruin what should be a healthy breakfast. Now, let’s take a look at the ingredient list on my bag of Montana Gluten-Free Oatmeal. Ingredients: whole grain rolled oats. Period. Wow, the oats are the ingredient. It’s the same thing with my bag of teff. Ingredients: whole grain teff. What a concept. The food is also the ingredient. To insure that my “compare and contrast” playing field is level, I’ll include the same detailed nutrition information on my porridge at the end of the recipe. 2. Slowly add oats and teff, stir well, and turn heat to low. Add vanilla, cinnamon, apples, raisins, and cranberries (if using). 3. Cook on low for about 15 minutes, stirring occasionally. 4. Remove from heat when liquid is absorbed and serve with a drizzle of honey (or maple syrup) and milk of choice. I like light coconut milk with it, but any nut milk will do. Note: Some people with gluten intolerance have an immune response to oats, even certified gluten-free oats. 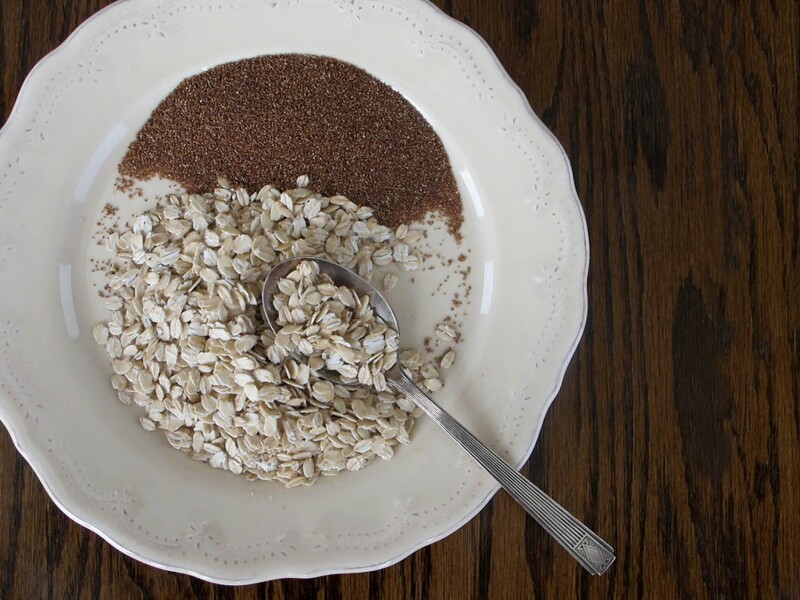 If you choose to try oats, start slowly (1/3 cup) to see if you react. Oats also contain a lot of fiber, which is a good thing, but may cause gastrointestinal stress if you’re not used to it. Check with your healthcare provider if you’re unsure about adding oats to your diet. Peace, love, and power porridge. Stay tuned for more healthy breakfast ideas for an active gluten-free life!